Our Mexican-style sweet potato rice is made by first spiralizing sweet potatoes and then quickly processing them in a food processor. This creates a fine "rice" texture to the potatoes! The sweet potato rice is then sauteed in oil along with a poblano pepper and garlic. Chicken stock and diced tomatoes are added and cooked until the liquid is absorbed. The dish is seasoned with some cumin as well as salt and pepper, to taste. It has the perfect consistency and is served best as a side with your favorite Mexican dish. This recipe is suitable for both Paleo and Whole30 meal plans. It is also a grain-free side dish. Per Serving: 85 calories; 3g fat; 12.9g carbohydrates; 2g protein; 1mg cholesterol; 215mg sodium. 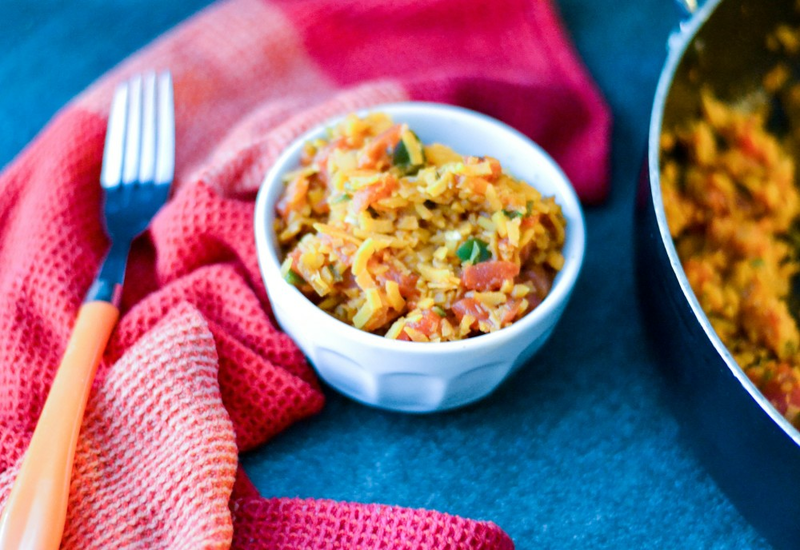 This sweet potato Mexican rice was perfect for taco night! I was surprised at how good it was, and very true to flavor of real red rice. Using cumin made this side dish taste very authentic. Definitely will make again soon! Very authentic tasting Spanish rice, you won't even hardly notice it's made with sweet potatoes! Incredible! I never knew sweet potato rice was a thing, but I am now obsessed. This also tasted just like Spanish red rice like my grandmother used to make when I was a kid. Love! I love Mexican red rice! I have the hardest time replicating the flavor, but this recipe was spot on. What I love most about using riced sweet potatoes (as opposed to cauliflower) is that it lasts longer and carries over to the next day much better. I would put cauliflower rice in the fridge and the next day it's gross and soggy. The sweet potato rice was good for another two days at least. I don't have a food processor so I just diced small, rice-like pieces. Such an easy recipe and great use of my spiralizer!